The day has come when you can know the instant an animal walks in front of your Moultrie Trail Cam. We review the setup, photo delivery, and features of this innovative new technology. But, did it work? Read on to answer that question. . . Very simply, you register an account on moultriemobile.com, sign up for a data plan and activate your modem. 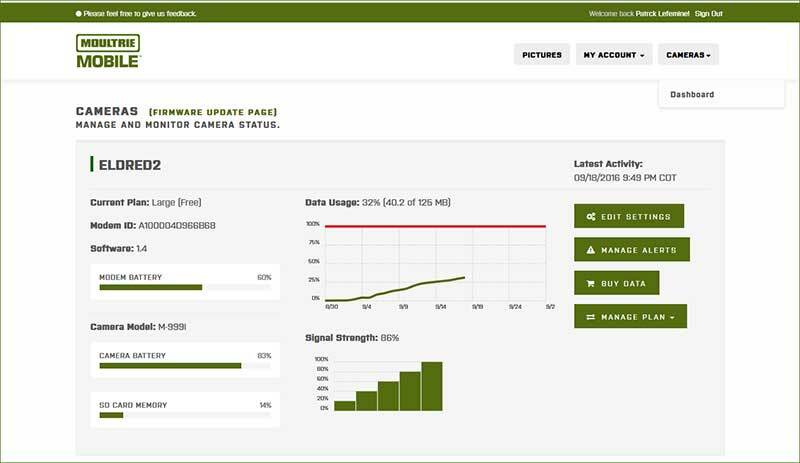 Then you connect your Moultrie trail camera (2015 models and later) to a Moultrie Mobile modem and you are good to go. As a trail camera photo is triggered the photo is transmitted to moultriemobile.com and you receive a notification. You can then access that photo either through your smart-phone or your PC - in real time. Photo Transmission Options - Immediate, 1x per day, 2x per day. Supported Desktops and Laptops - All, since it is a website it works with all current browsers. Power/Batteries - The unit requires (8) AA batteries (Alkaline or Lithium batteries) with Lithium being the most preferable for cold weather and extended run times. 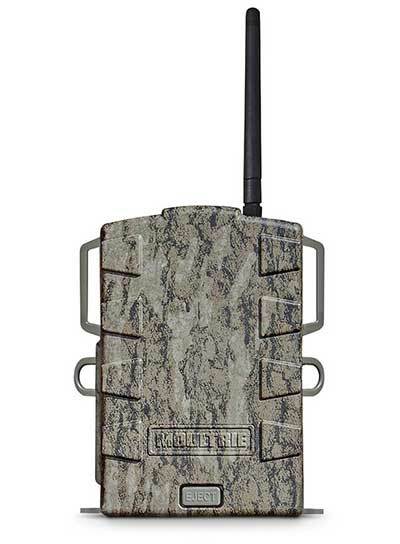 Cell Coverage – Moultrie Mobile utilizes a Verizon Wireless network and there must be coverage in the area you wish to place your Moultrie Trail Camera. Data Plans - Prices range from 9.99/month for a small account to 49.99/month for a Professional Account. This is the main Pictures page on Moultriemobile.com. It shows the photos that were coming while I was writing this review. This particular camera is 7 hours away. When you click on an individual photo it expands it and provides detail as seen in the right border. I requested a Hi Res photo to see more detail from this 8 pt. Here are a couple screen-shots from the Moultriemobile.com APP from my IPhone. 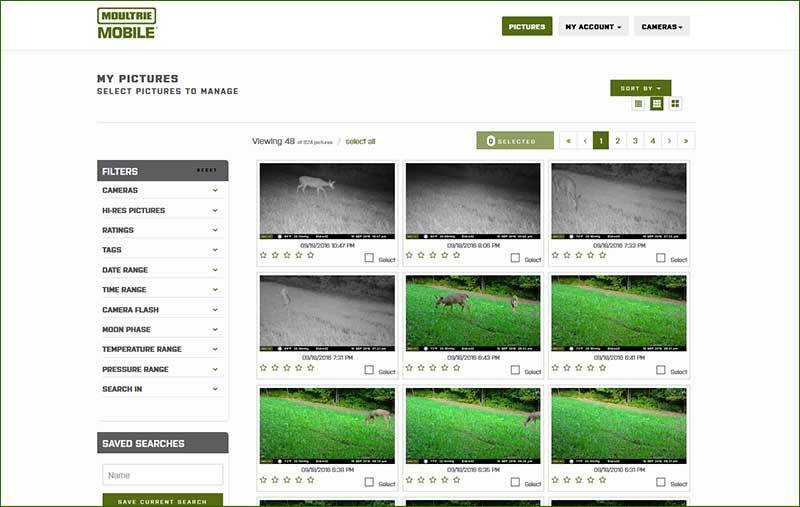 The camera page displays status from your activated trail camera attached to moultriemobile.com. Here you can see my signal is 86%, I have 60% modem battery remaining, and I have used 32% of my data plan. Clicking on Edit Settings bring up this page. Here I am demonstrating how I can change my photo resolution from LOW to HIGH. Once I click save the camera settings are changed from 400 miles away. You can adjust things like color, lighting and contrast right in the APP here I made some changes to get a better look at this buck photo taken at twilight. After receiving my device the first thing I did was I read the manual. I can’t stress this enough. There are things you HAVE to do for your camera and mobile device to work together. Pay attention to this or you will be frustrated. It’s relatively easy and it worked on the first try. Now, it’s important to set up your mobile unit and camera at home first. Don’t do this in the field. After everything is working and transmitting, move it to the field. 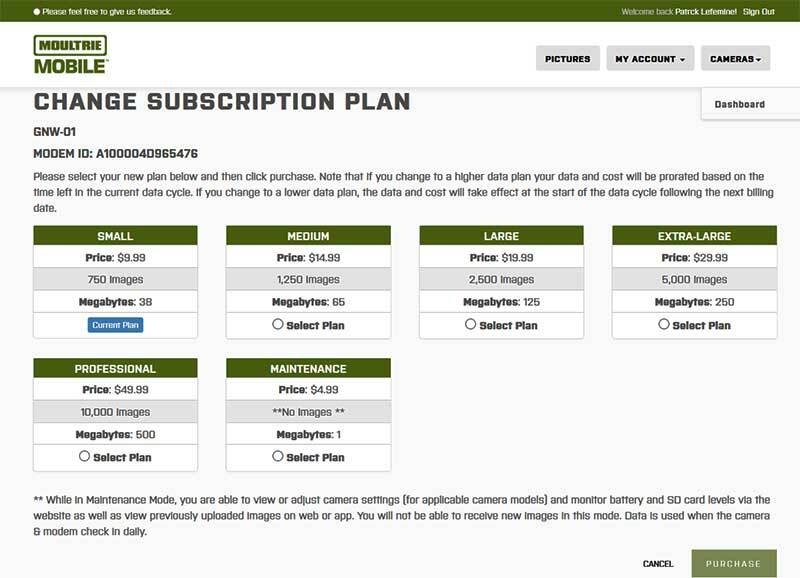 Step one - make sure your Moultrie camera is compatible with Moultrie Mobile. Moultriemobile.com makes this very simple. 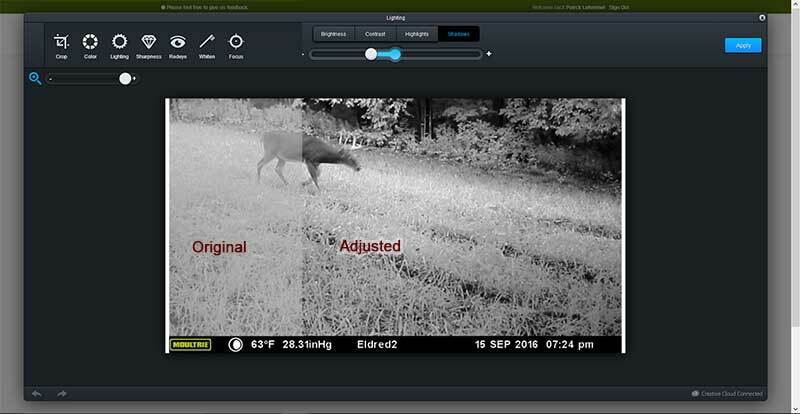 Basically, if your Moultrie Camera was a 2015 or later model it should work. Step two - This is the only part you might find confusing. You will likely need to update your camera’s FIRMWARE. This is an important step and it’s pretty easy. Go to the page where the compatible cameras are listed and click on your particular model. Then download the firmware update file onto an SD Card. Put the SD card into your camera and navigate to the menu item called update firmware. You will only have to do this once, but it is necessary. Step three - Create an account on MoultrieMobile.com and activate your device. This step is easy. On the back of the camera you will see two numbers, a Serial Number, and an ID Number. Enter them both on the activation page. After activation, you choose a data plan and enter your Credit Card number for monthly billing. Opinion: I think the majority of hunters will be able to follow these steps without difficulty. However, if you are still using a flip phone and wish your TV had a dial, then the setup process will likely frustrate you. Let’s do this. Rate yourself on a scale of 1 to 10 - with 10 being an IT expert and 1 being completely lost with technology. If you rated yourself a 4, or higher, you should be OK. If not, find someone to help you. I had an interesting discussion with the Moultrie Rep when I first saw these plans. I’ll relay to you what I relayed to her. If you are thinking about buying a mobile unit for every one of your deployed trail cameras - it will get expensive in a hurry because each camera requires its own data plan. I run over 30 cameras but realistically I’m only going to pick 2 or 3 where I really need remote viewing. Here is a screen-shot of the various plans available for Moultrie Mobile. I am currently using SMALL for this plan. Now it’s likely that these plans and the pricing may change over time but in 2016 they ran from $9.99/month to $49.99/month. There are no contracts, no activation fees, and no change fees or penalty fees. My first reaction was that it’s a little pricey, but then I noticed how you can scale up your plans for the hunting season and then drop them back to what Moultrie calls a Maintenance mode. Basically, you can put your plan into hibernation in the off season and pay only a small monthly fee during those times. Then in September, October and November simply change to the plan that best suits you. 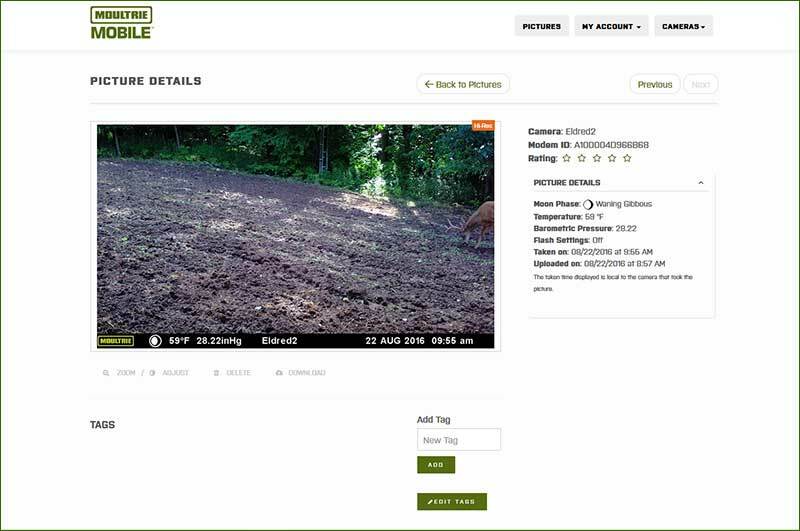 This was a smart move by Moultrie and very fair considering the benefit of remote access to your trail cameras. The first thing to understand is that photos are uploaded to your account. They are not sent to your phone or email. There are three options for Photo delivery: Immediate, which means that a photo is sent instantly to your account as soon as it’s been taken. There are two other options that include one batch per day or two batches per day. Every time photos are uploaded to your account you will get an alert. You can choose email alerts, text alerts, or both. If you have your camera upload set to Immediate, and choose SMS notification - you will be getting texts all day and all night as photos are taken. This may be distracting for many people. Once you receive a notification you simple go to the Moultrie Mobile APP and view the photo. It’s extremely simple and easy to use, but it requires a cellular connection. I found the upload features flexible and reliable. I tested both batch and Immediate mode and both worked well. Basically there’s a battery compartment, a battery meter and there’s a cell coverage indicator. There is nothing else, not even an On-Off switch. When I first heard about Moultrie Mobile I figured it was just going to get a text or email notifying me about a new photo. After setting this up and using it for a few days I learned that the capabilities go far beyond that. Moultrie Mobile can be accessed in two ways. You can visit Moultrie Mobile.com or you can download the free Moultrie Mobile !PP I have not tested the !PP on an Android but I have been using it extensively on my IPhone and it was simple to install, and easy to use. While getting a photo remote is definitely the most compelling feature for Moultrie Mobile, I had expected that. What I did not expect was the ability to control my remote camera. Like many of you, I set up trail cameras on properties that are a long drive away. My closest trail camera is 2 hours from home. The bulk of my cams are 3 hours away, and I have one property that is 7 hours away. I can’t tell you how many times I would have loved to know the battery levels, or how much room was left on my SD Card. With MM I can check these status' from anywhere in the world through my Internet connected modem. But there’s more to it than just a status. I can actually change my camera settings remotely. This is an incredible feature for those of us who have remote cameras. 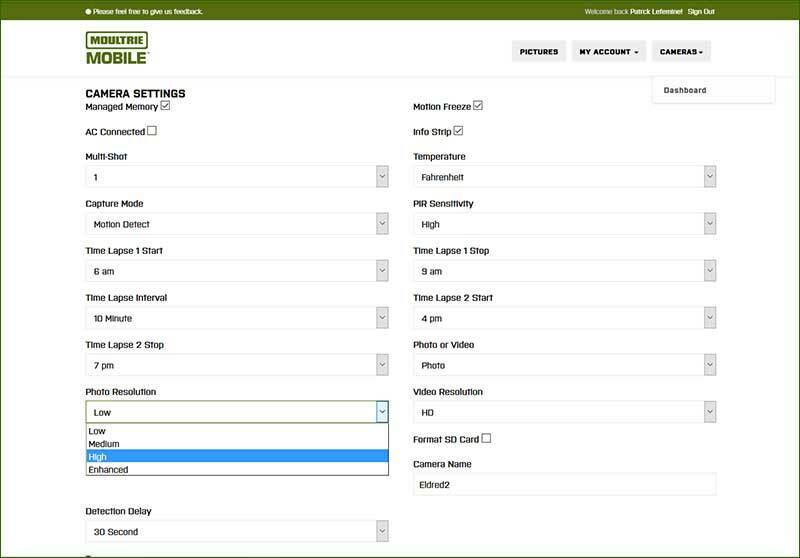 For example, if I wanted to change the detection delay from 1 minute to 10 seconds I simply go to Moultrie mobile.com, choose cameras, dashboard, and then edit settings. Scroll down to detection delay and change it to 10 seconds. Click Save, and you’re done. You can also do things with your photos. You can delete the photo, download a high resolution copy, you can even do some basic adjustments. If you have a lot of photos you can categorize them by barometric pressure or moon phase. I can basically build an entire sorted and search-able inventory using the MM application. The features are extremely impressive and very easy to use. In two words - Game Changer. In conclusion, I am extremely impressed with Moultrie Mobile. It worked flawlessly. My first mobile device is 7 hours away and I now can access all my photos as they are taken. I can also control the camera from anywhere. This is huge. There is a cost to the plans and you’ll need to decide how that fits your budget. I find the costs to be reasonable but I should warn you, the service is not cost effective for guys wanting to access dozens of trail cams. That's because each cam requires it's own data plan. Unless you have excess discretionary income, expect to pick out a couple key trail cam locations and add moultrie mobile only to them. I found setup to be relatively easy. But there are steps and you have to follow or you will be frustrated. We have an acronym in IT called RTFM - that stands for "Read the Fn Manual" and I can't stress that enough. It’s important to remember that your mobile device requires a good cell signal and you will most likely need to update your camera’s firmware. If you are already confused - ask your kid, niece, or grandson to help you out. The !PP is fantastic and the website is simply outstanding. Moultrie really 'killed' it with the design and features built for moultrie mobile. I use it every day since my cams went up 30 days ago and have experienced zero problems. I'm more technical than the average hunter so take it for what it's worth. I build websites so I am comfortable saying that most people will find it easy as well. I am not going to address any ethical considerations of using the Immediate setting on Moultrie Mobile. This technology gives you instant notification to anything that triggers your trail camera. There will be some that feels it provides an unfair advantage. I understand the concern and I’m sure it will be debated on Bowsite.com. 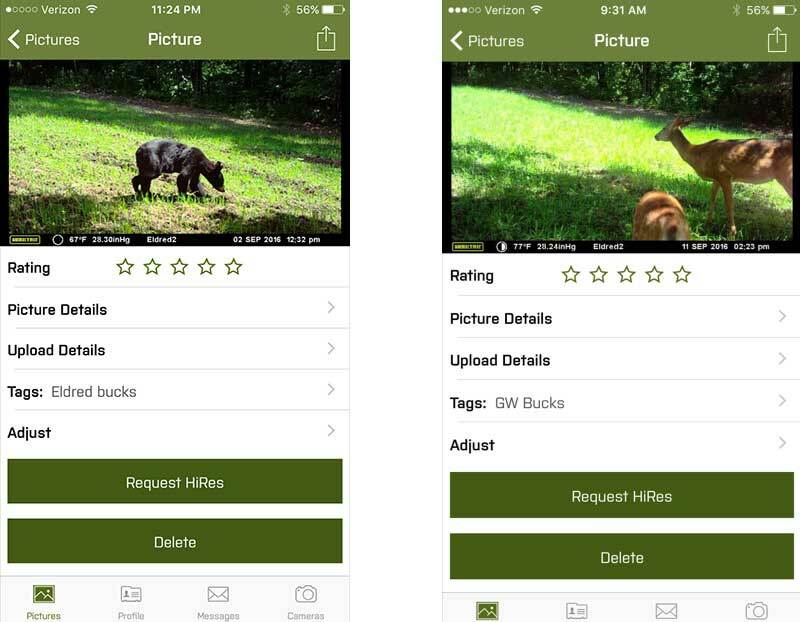 Moultrie Mobile gives you options of when the photos are uploaded so if it really bothers you then switch to one of the batch modes available. One serious negative. And I want to warn everyone about it. Moultrie Mobile is addicting. This is a game changer.